It is not just the elderly and infirm that have concerns about visitors to the front door of their premises, lone workers in industrial and remote buildings are also potentially exposed to undesirable callers at the front entrance door. And even when the property is unattended, it is often nice to know who is calling at your front door and what they are up to such as when regular malicious damage is being caused or even when an attempts are being made to break in. The WiFi Door Peephole Camera provides a comprehensive monitoring solution providing the ability to instantly vet visitors and video record their activities in front of the door for evidence and subsequent identification purposes. 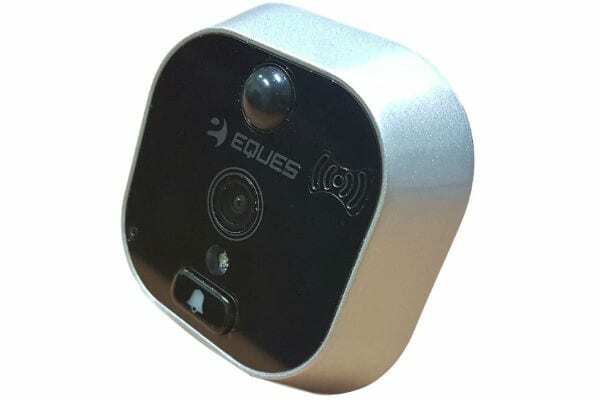 This new unit has been cleverly designed to link the functionality of the doorbell with the camera capability all into one with a doorbell button forming part of the part of the device that is seen from the outside of the door. The external design also includes a small day/night sensor that enables for changing light in the outside environment. When the doorbell is activated this switches on the camera and also the 7 inch flatscreen that forms the second part of the product and is affixed to the inside of the front entrance door. The doorbell will ring through the flatscreen speakers and from the inside of the door whomever is in front of the door will clearly be displayed on the touchscreen. At this point, by pressing the camera icon on the screen, an image can be taken of the caller before the door is answered. Where this system differs from most other door monitoring products is the ability to link up through the WiFi to enable remote monitoring and control through a free Smartphone App. (Android or iPhone). Doorbell activation and motion detection events from the peephole camera can both be set to alert the smartphone through the app and then the linked Smartphone user will then be able to view through the camera ‘live’ and also have two way communication with the visitor at the front door if desired. this ability provides the perfect solution when a package is delivered when nobody is in and the person delivering needs to be given instructions. Also to answer for an elderly or infirm relative who would normally struggle with callers at their front door. There is no limit on distance that the Smartphone has to be in relation to the Peephole being monitored, although the Smartphone will however need an Internet connection where it is for this facility and the Peephole camera wil need to be paired with the WiFi at the property. Motion alerts do not always have to alert the Smartphone app. and in any case motion detection video recordings wil automatically be catalogued onto a micro SD card inserted into the touchscreen monitoring system (32GB maximum capacity). Peephole cameras are most effective when the incorporated lens is of a wide angle, although many systems are only able to provide a distorted ‘fish eye’ view. In this regard this camera system certainly doesn’t disappoint as it features a 120 degree capability and the digital software for the device enhances the resulting imagery into a squarer more viewable image. Standard peephole systems can also suffer from inability to accomodate the hours of darkness, but for enhanced security the WiFi Door Peephole Camera has a day/night sensor and night vision capability so you will always be able to view decent imagery of what occurs in fromt of the camera even at night when there is little or no illumination available. No specialist technical knowledge is required to install or use the camera system, although some may feel more confident asking Carpenter to fit the peephole unit into the door. 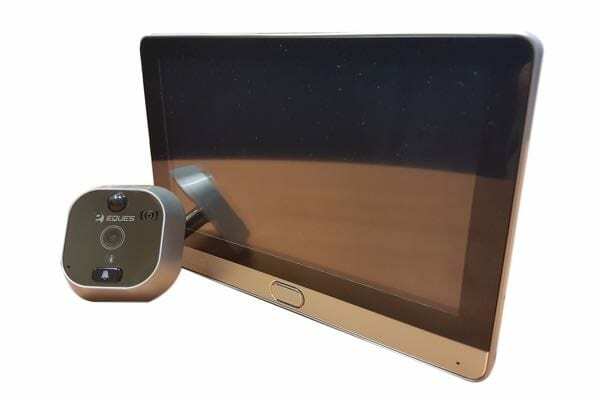 The touchscreen can be attached to the inside of the door using the baracket provided. The device is powered by a rechargeable Lithium Polymer internal battery than can provide a standby time of up to 30 days on a full charge. The app is available for free download on the iPhone App Store or on Google Play Store. Linking the system to the WiFi is a very simple operation. As an option the unit can be supplied with a 32GB micro SD card from recordings/snapshots, although any micro SD card up to 32GB should be compatible for use. View ‘live’ through the camera and talk to the visitor at the door if required via the Smartphone app. You will need to have an internet-connected Smartphone (iPhone or Android) to be able to remotely view and hear what the camera is seeing. You WILL need the password to the network on which you wish to install this WiFi camera system for the initial set up procedure. You may need physical access to the WiFi router.